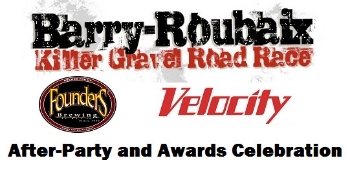 Welcome to The Founders Barry-Roubaix Killer Gravel Road Race week and the official start of the 2014 race season. We have created one document with everything you need to know for race day, including; packet pick up, race waves & times, event area map, awards celebration and after-party schedule.........view the info under files and maps tab 1. Race course alternate route: Due to the deep snow conditions and lack of emergency access to Shaw rd. and Both Sager roads, they have been removed from the race. The alternate routes on the race course map under maps tab (highlighted in green) will be used and the course will be marked reflecting this change. There's also one erosion area on Head rd near Little Pine Lake 2. Team Scoring Competition Update: We currently have a total of 73 teams competing in the team competitions. To view the latest list of teams by race and Team tents designated set up areas ( first come first serve) go to the team competition tab 3. Race waves and times: on the web site under maps and file 4.BIB #'s will be available on the website soon under maps and file We will also have listings at packet pick up 5. Miscellaneous Race info Be sure to start in your correct race wave. The back of your number plate will have your wave and start time based on your registered race and your age on 12/31/2014. We will only stage 3 waves deep at a time so you can keep warming up We will have 2 split timing mats on the courses and anyone deciding mid-race to drop down from their registered racing category will be DQ'd on the posted results. Under no circumstances can we adjust your category choice post race. New finish route this year!